Playing basketball in LF2 - What happened in round 19? Playing basketball with three-point shooting as the main weapon could be interesting in LF2. This weekend when teams failed to break the zone or ran out of ideas a lot of times the ball was kicked out for a three-point attempt. Cavigal Nice have some of the best three-point shooters in LF2. But this weekend the only way they found of breaking down Dunkerque was to launch long-distance shots to then pick up the offensive rebounds. They had 30 attempts from beyond the arc with just 4 shots hit. However they finished the game with 19 offensive rebounds, and also had 20 defensive rebounds. Although the hosts, Dunkerque Malo only took 14 shots from behind the arc they connected three times. Yet they struggled to finish inside the paint despite picking up 14 offensive rebounds. All in all, it was a strange game with Cavigal Nice controlling from the start. They never trailed and won comfortably (67-47). 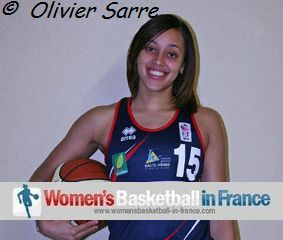 Fabienne Constant led the way with 16 points while Margaux Galliou-Loko (in picture) followed up with 13 points. It has been tough playing basketball at Limoges since their participation in the LFB during the 2009-2010 season. Finally the supporters and players from Limoges have something to smile about after a comfortable victory against US Laveyron (82-57). Thazina Cook (in picture), who is finally fit, scored 22 points and was a perfect 1-of-1 from the three-point line while the hard working Iva Grbas added 21 points. In addition Martine Barba mastered the rebounds while scoring 15 points. But it was Princesse Gouba with her crossovers and acceleration that lit the game up. Limoges did hold themselves back from shooting three-pointers with just 2-from-9. US Laveyron who were without Elena Vishniakova just had one of those days where nothing worked in playing basketball. They went 4-of-16 from the three-point line and just 9-from-20 from the free-throw line. The CFBB have to wait a little longer for their first victory on the hardwood after falling at home to Pau Lacq Orthez (53-75). The CFBB have a number of sharp shooters. Yet they only connected three times from 15 attempts from beyond the arc. 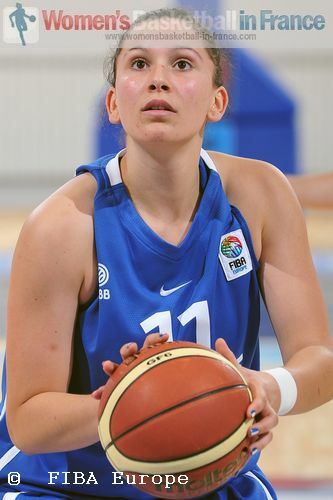 However for Pau Julia Borde showed them how to finish with 4-from-6 in a game high 16 points. For the second time this season Angers won their derby encounter against Roche Vendée. Julie Barennes put Angers in front for good with six minutes to play (52-51). Both teams missed crucial free throws down the stretch and Angers hung on to win (62-59). COB Calais beat Reims (83-67) in the final match of the weekend. A highlight video of this match is below. The key points of this match were that Reims hit 11-from-22 shots from behind the arc with Anaïs Jomby winning the prize of best shooter with 6-from-7. 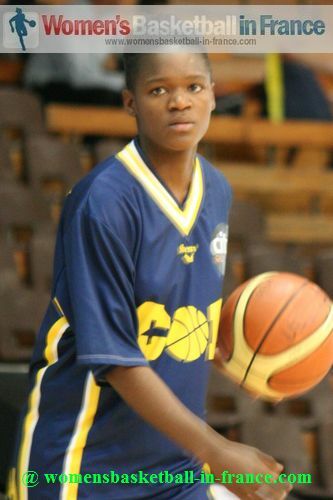 For COB Calais Aurelie Cibert was the only player to connect from beyond the arc (5-of-8). She finished with 18 points but was beaten by Manon Sinico with 19 points. However the performance of the game belongs to Pauline-Mélissa Diawakana (in picture) who knocked in 13 points in her first start of the season.